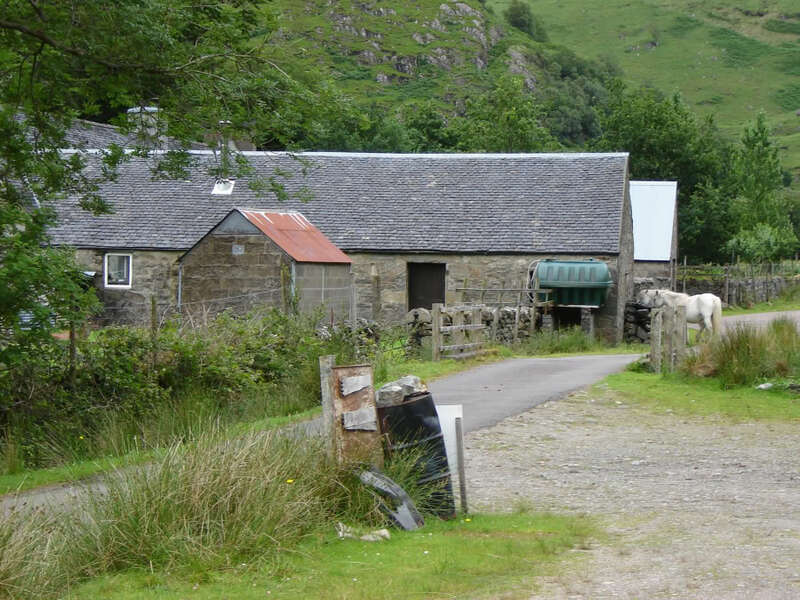 After finishing work on Thursday I drove to Kinloch Hourn, where I spent the night at Kinloch Hourn farm B&B. 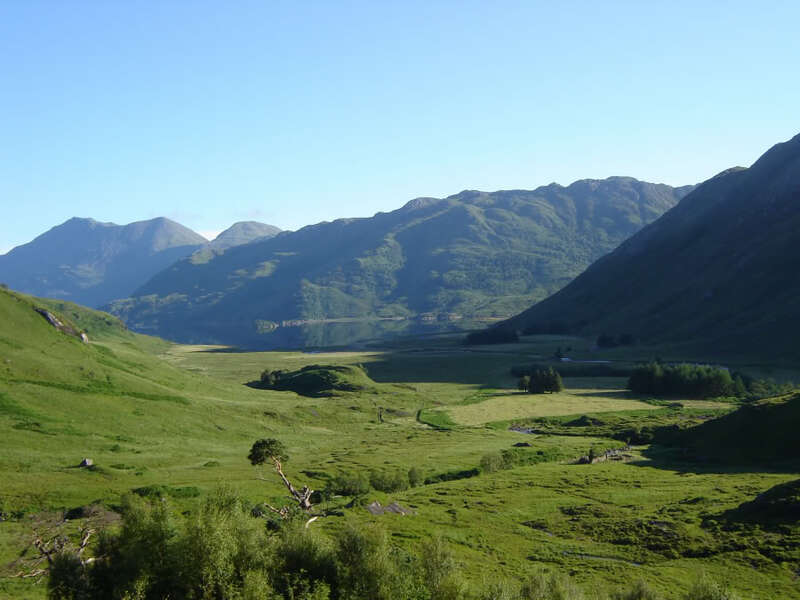 The MWIS forecast on Wednesday predicted a lovely sunny day for Friday. The MWIS forecast on Thursday predicted showers in the morning. On Friday, the reality was 7 hours of non-stop rain. 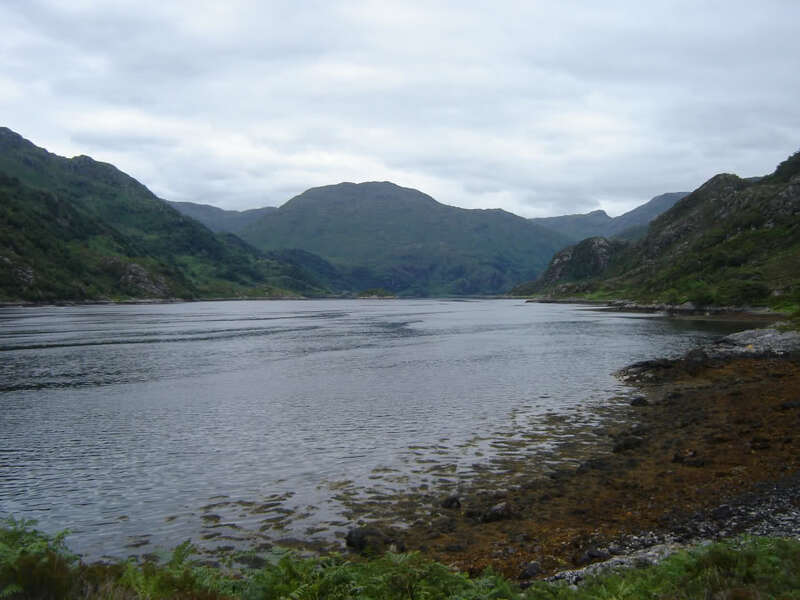 One of my friends dropped me off at Coireshubh before catching “Billy the Boat” from Kinloch Hourn to Barrisdale. 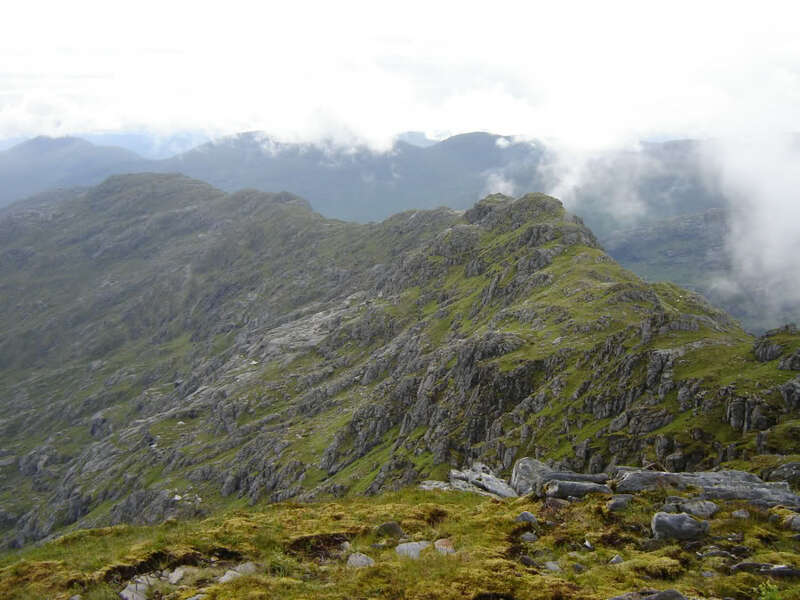 From Coireshubh, I followed the zig-zagging stalker's path up the standard ascent of Sgurr nan Eugallt. 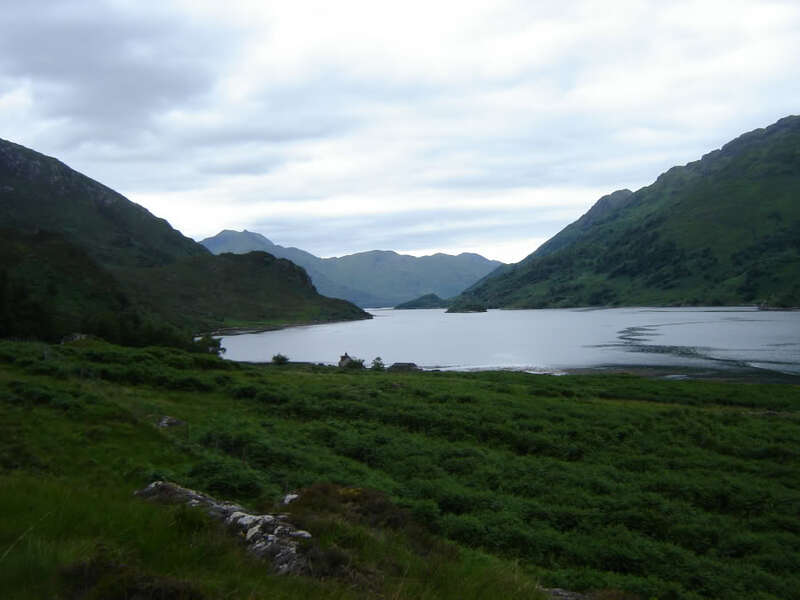 Within about 30 minutes of walking, my boots were squelching – as I hadn't bothered packing waterproof trousers. 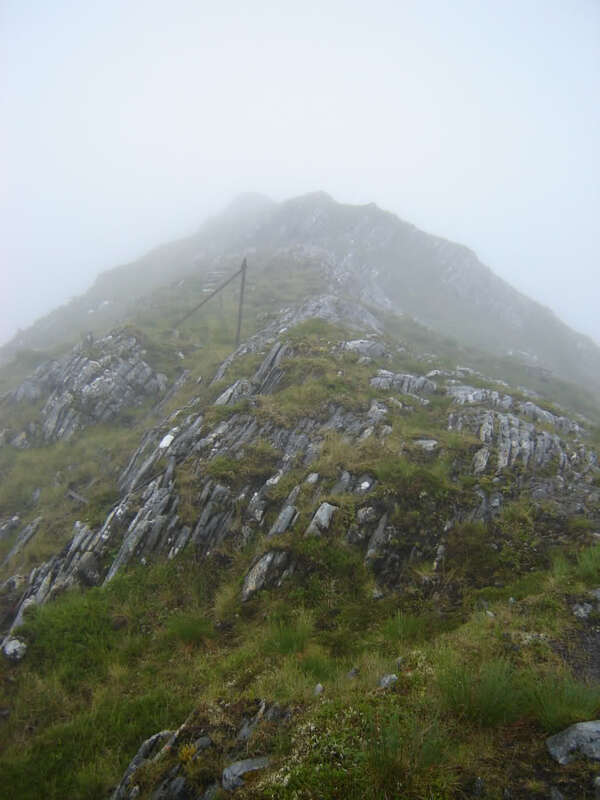 The stalker's path was useful for a quick ascent to around 600m. 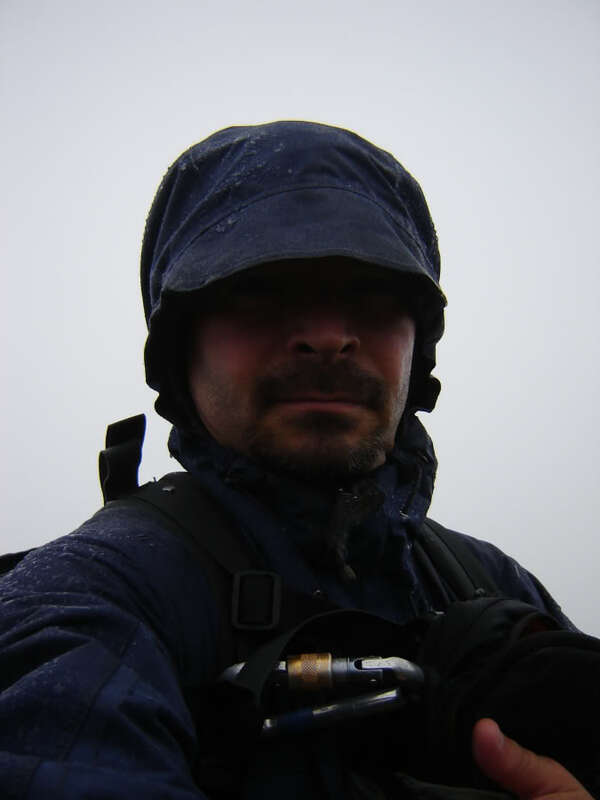 Once onto the ridge, I followed the line of rusty fence posts as far as a steep section. Soon thereafter I reached the trig point. Prior to doing this hill about five people reminded me, “remember the trig point is not the summit”. Good advice but I was traversing the ridge and therefore would be doing all the tops. 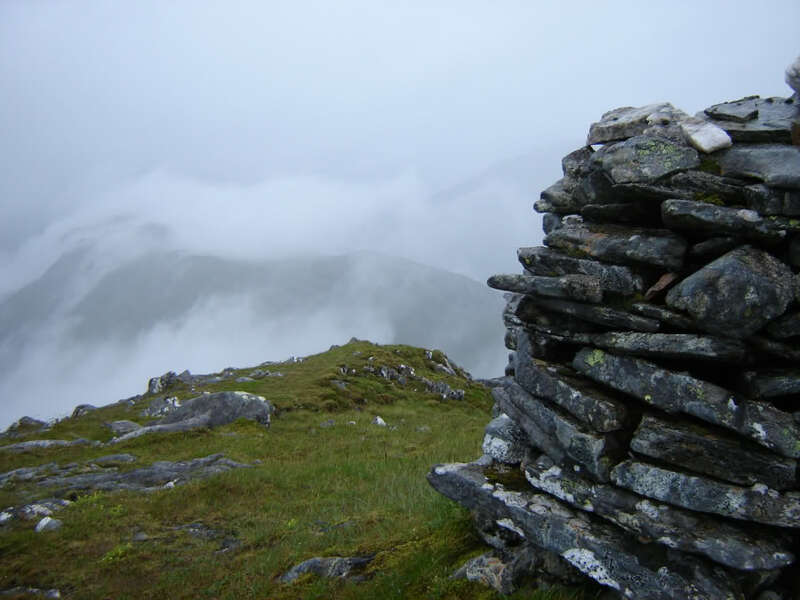 From the summit of Sgurr nan Eugallt I was in low cloud and continuous rain for the next 4 hours. 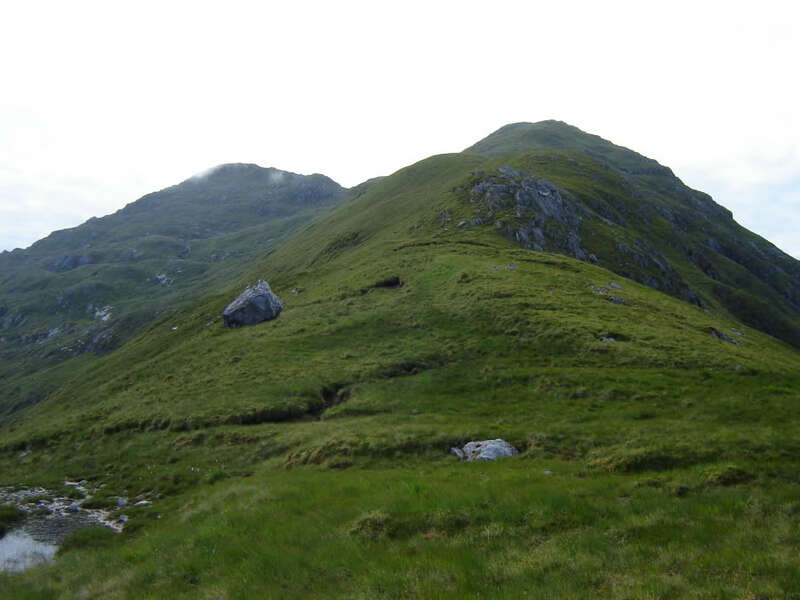 From Sgurr Sgiath Airigh onwards, I programmed the occasional way point into my GPS as I progressed along the ridge. 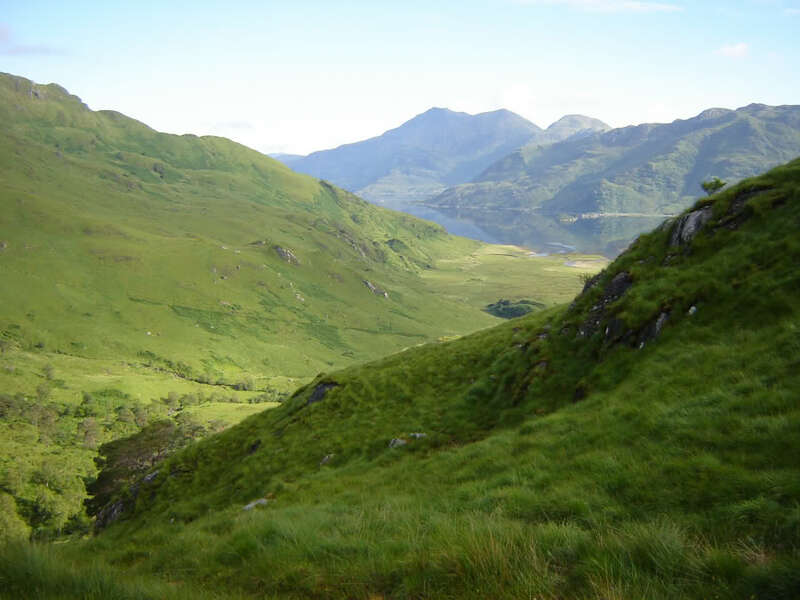 The descent from Sgurr nan Eugallt to the col before Meall nan Eun took longer than expected. 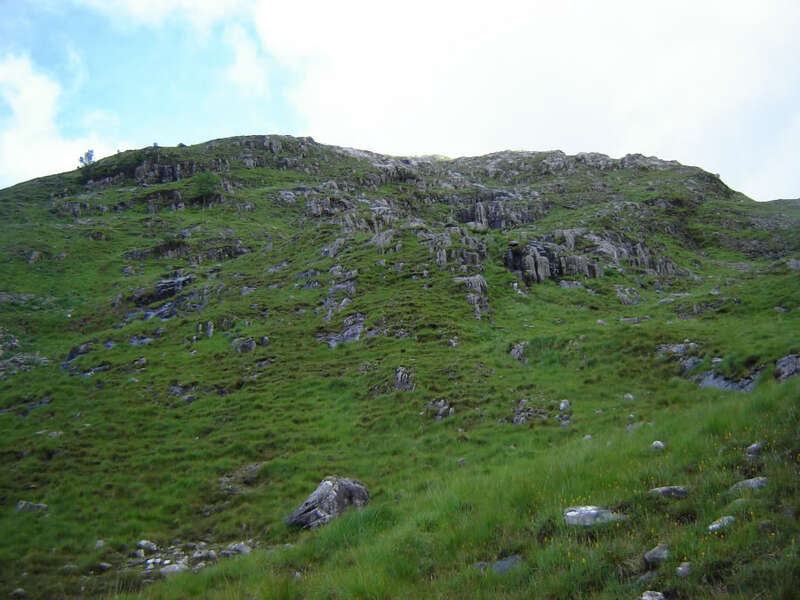 The descent is mostly on grass, however, there are lots of little knolls to skirt around and a gully to avoid. 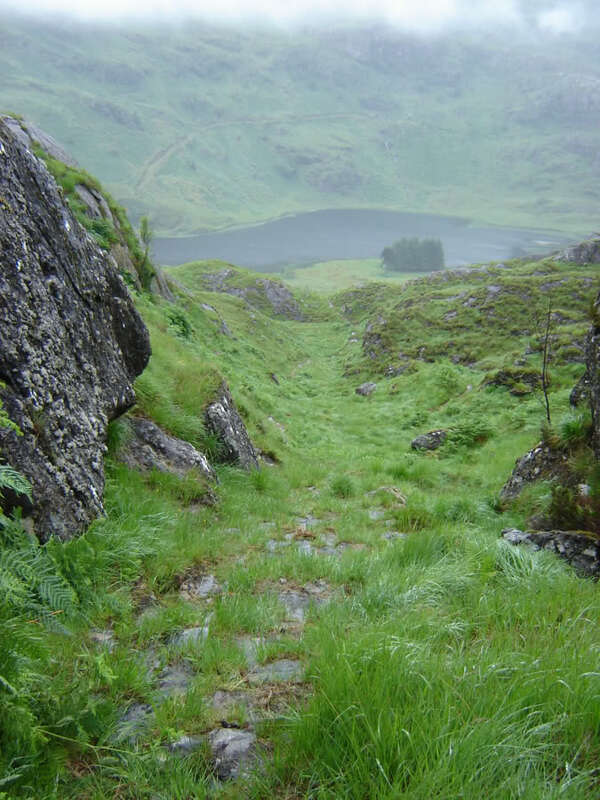 I descended to the left of the gully. 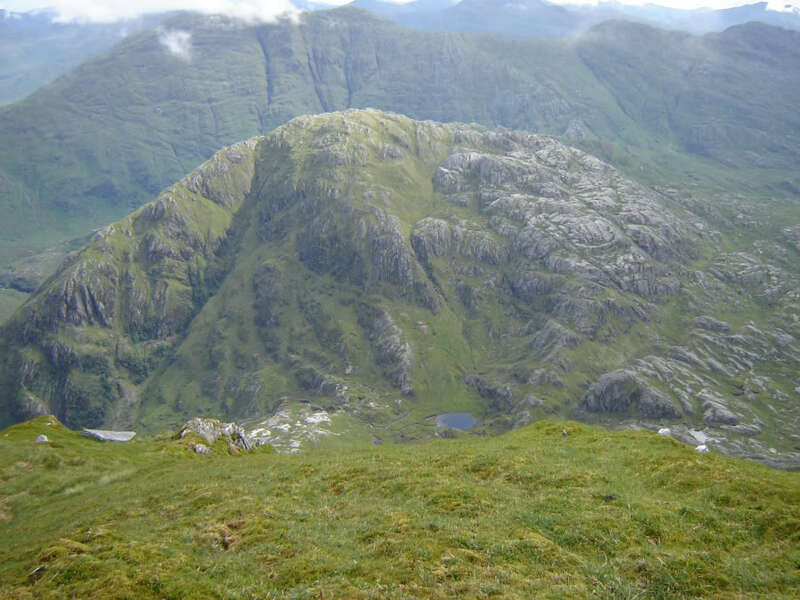 From the col, the ascent to the 630m top of Meall nan Eun was straight-forward. 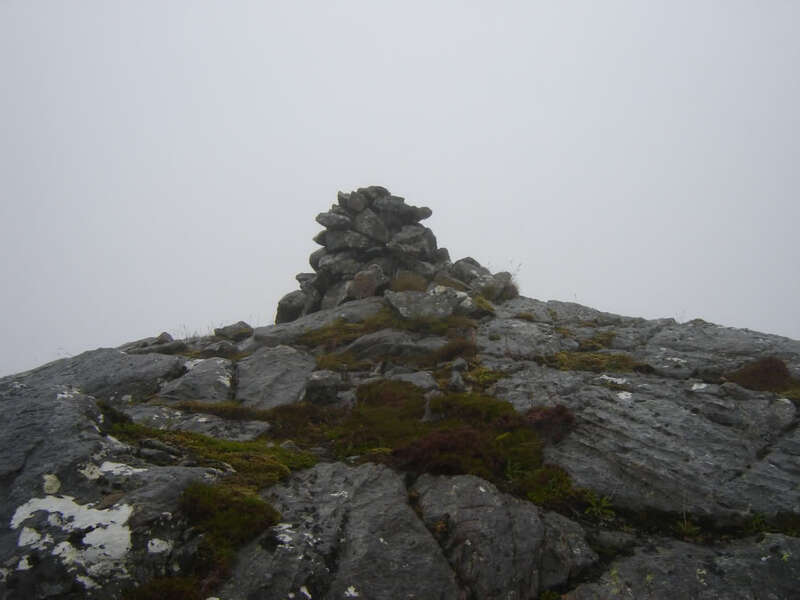 I then made my way along to the 660m top marked Meall nan Eun before again using the GPS to get me to the actual summit at 666m. 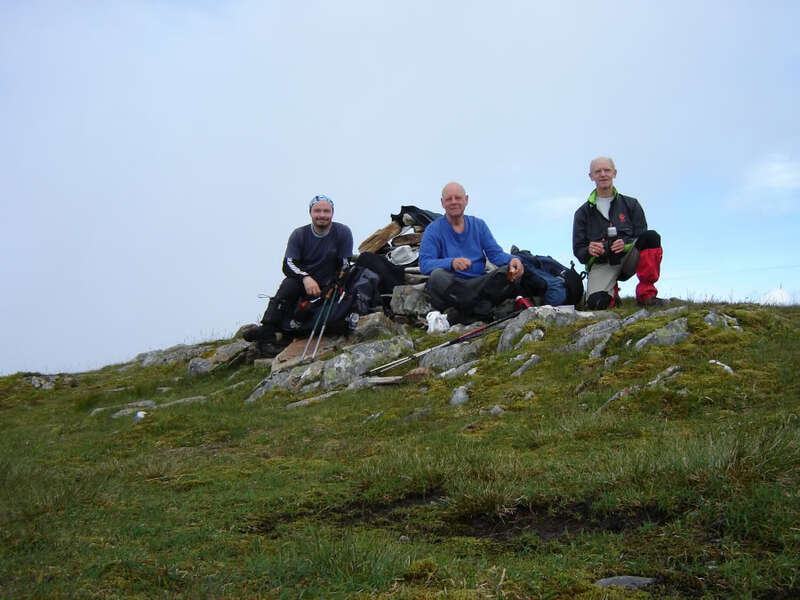 At the summit of Meall nan Eun, my GPS packed in – battery compartment full of water. From there on it would be back to good old reliable map and compass. 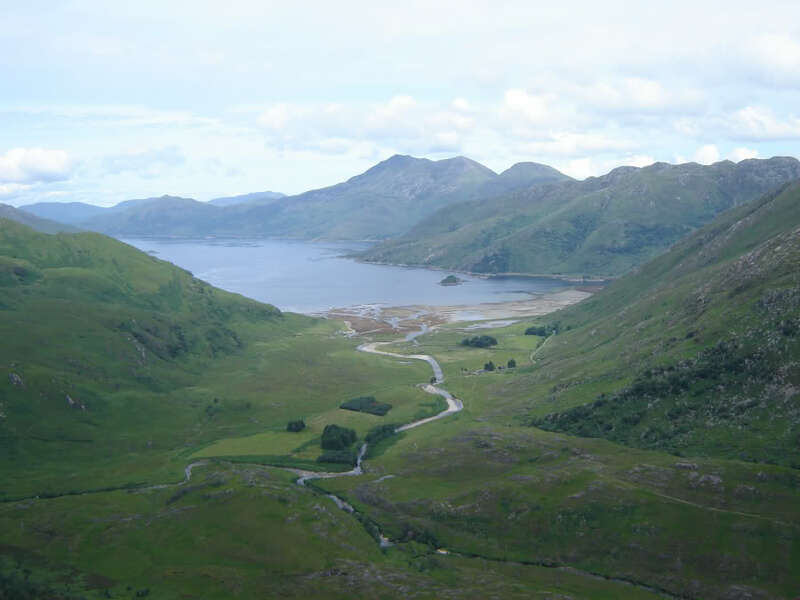 It took me around 20 minutes to find a way off of Meall nan Eun towards An Caisteal. 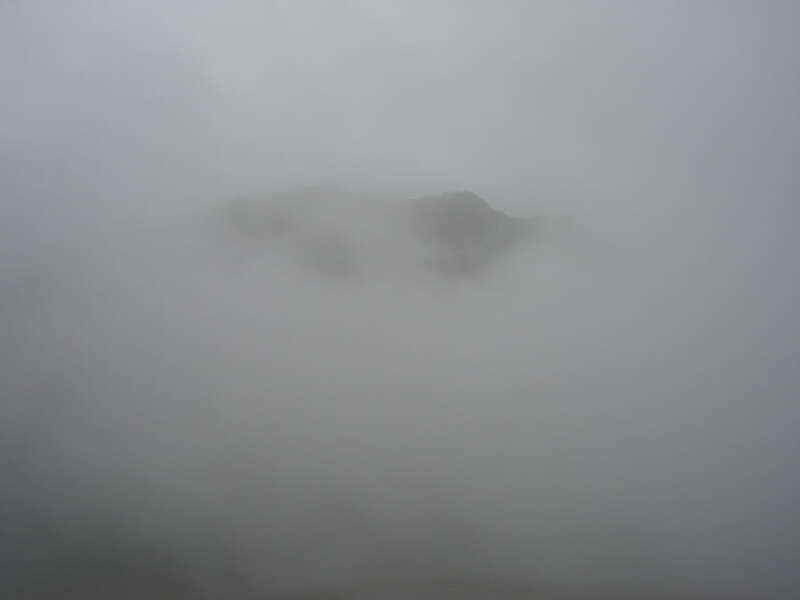 Visibility was around 20m at most. 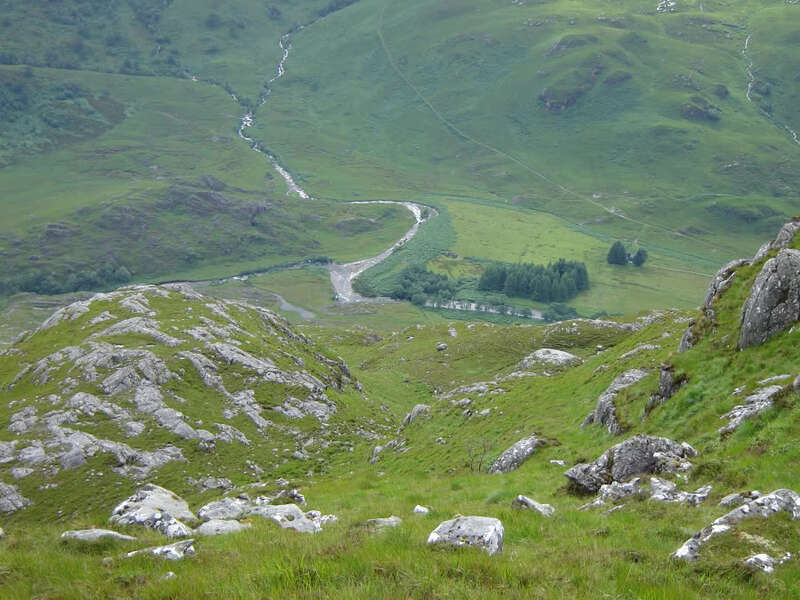 After finding a way down through the crags I made good progress towards An Caisteal. 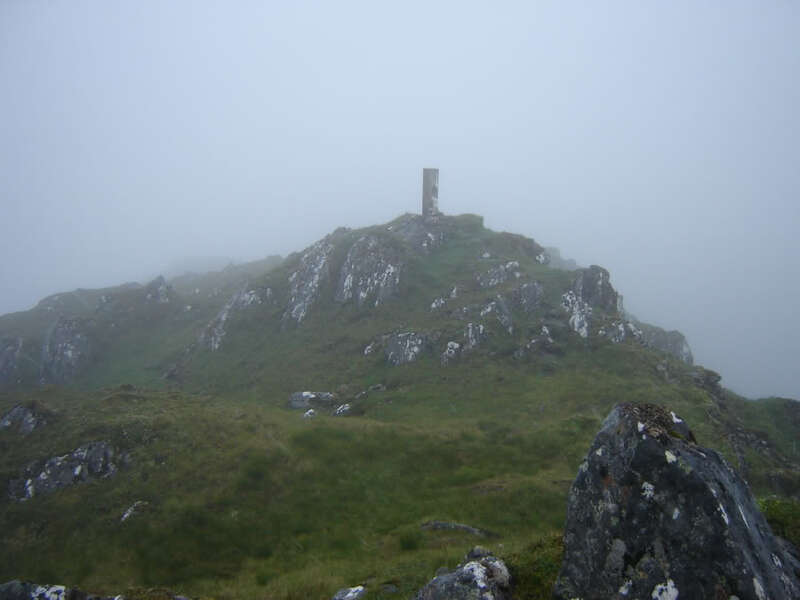 Reaching the summit of An Caisteal was reasonably straight-forward in the mist. 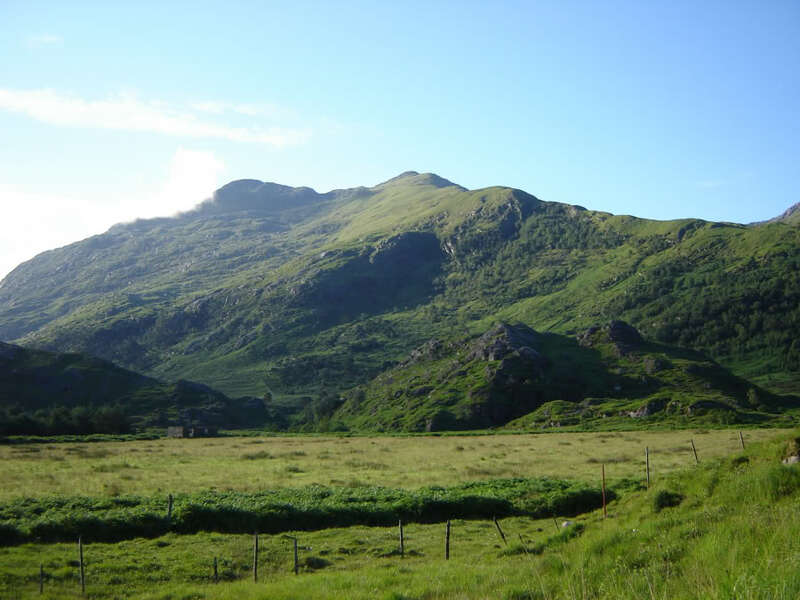 It is a very rocky hill. 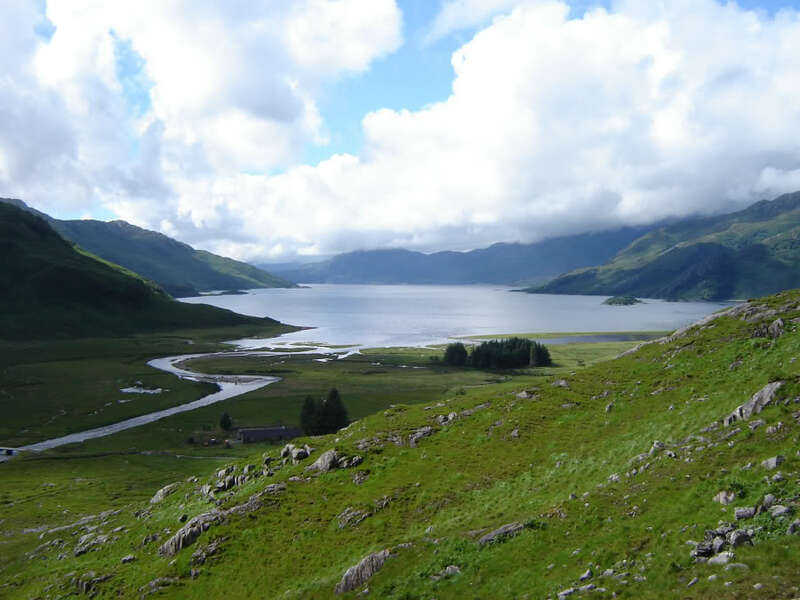 From the top, I began my descent towards Beinn Bhuidhe. I couldn't find a way off. 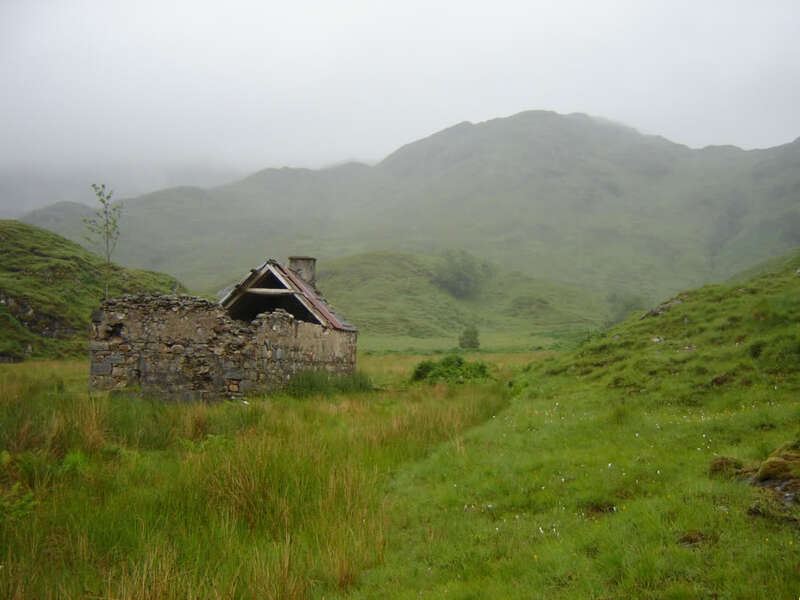 Indeed An Caisteal is “a castle”. 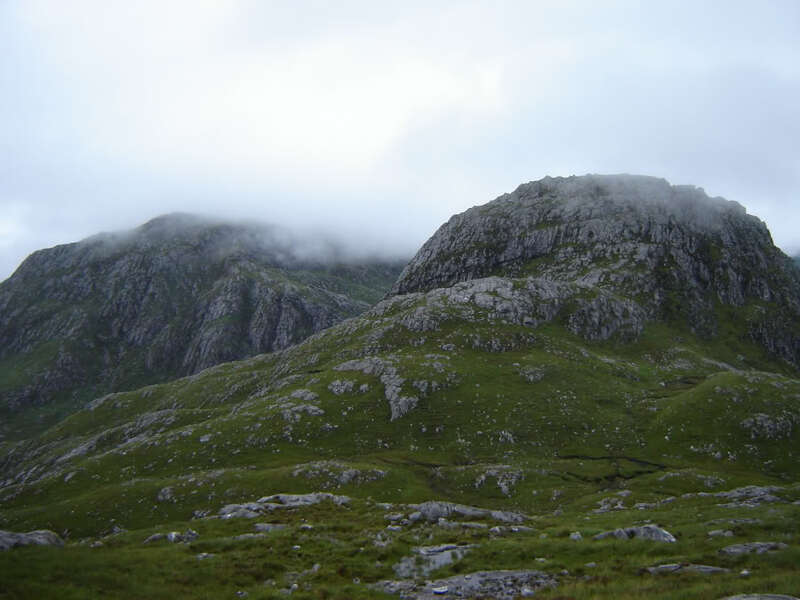 Thankfully the low cloud started to lift and I could then see there was no easy way off An Caisteal. 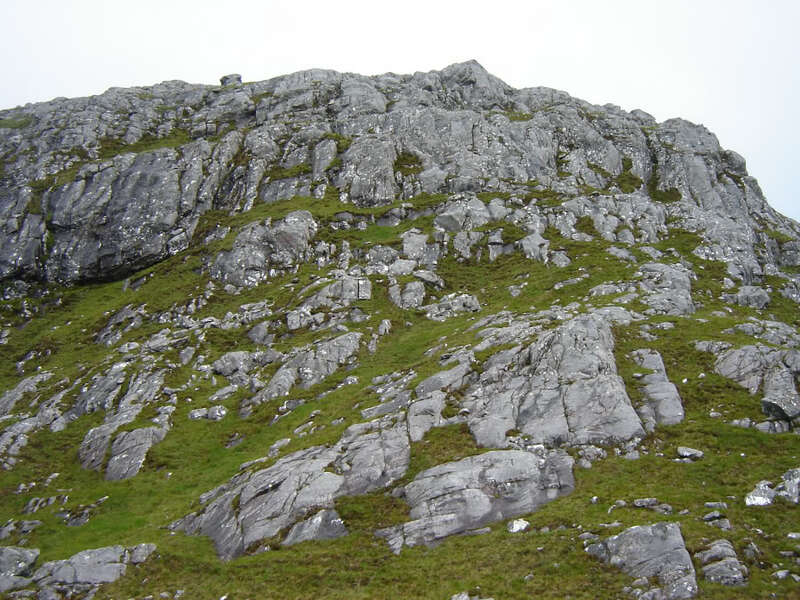 To descend from An Caisteal, towards Beinn Bhuidhe, I had to down-climb perhaps 20-30m of very wet rock at around Grade 2/3. If there was an easier way off, I didn't find it. It was nice to start getting some limited views having been in cloud for so long. 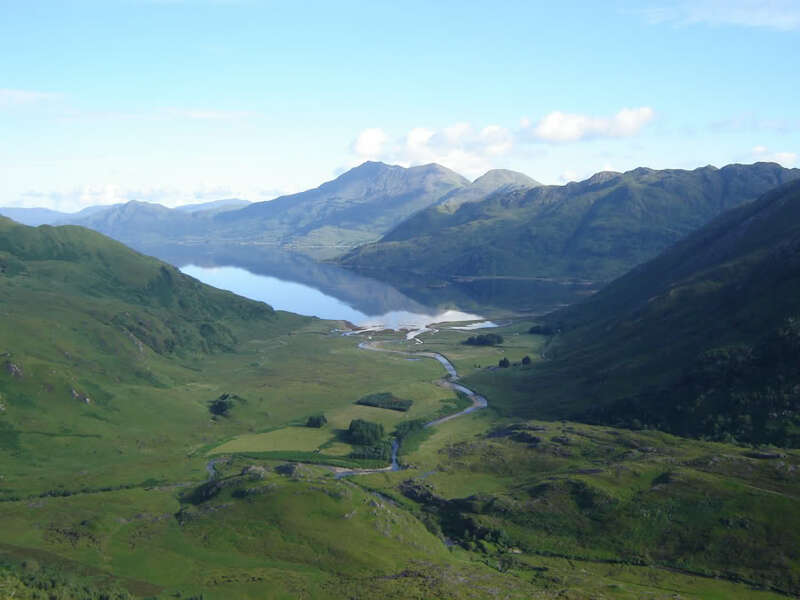 After reaching the top of Beinn Bhuidhe I opted not to carry on to Carn Mairi. The descent took quite some time as it was very steep. 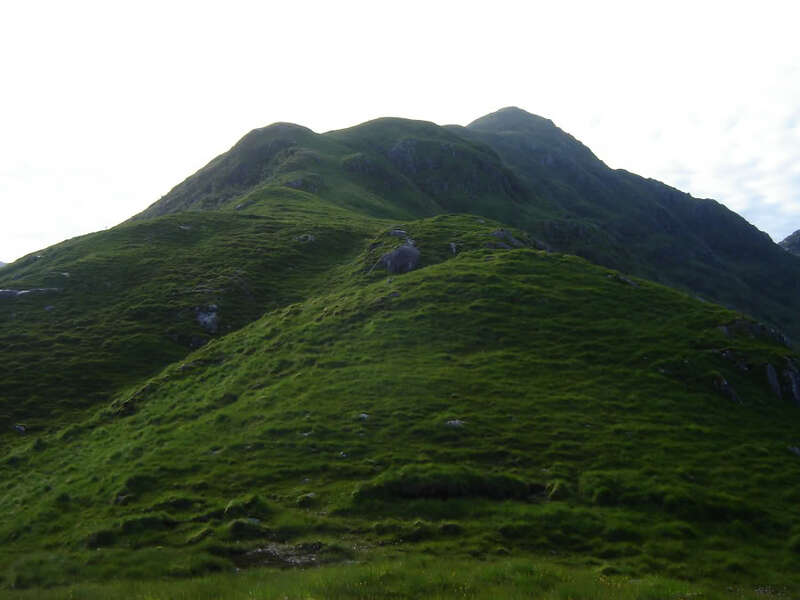 On reaching the base I could see that it would have been easier to continue on to Carn Mairi or to descend from the col between Beinn Bhuidhe and Carn Mairi rather than directly from Beinn Bhuidhe. Was nice to reach the Whitehouse and take off my heavy pack. 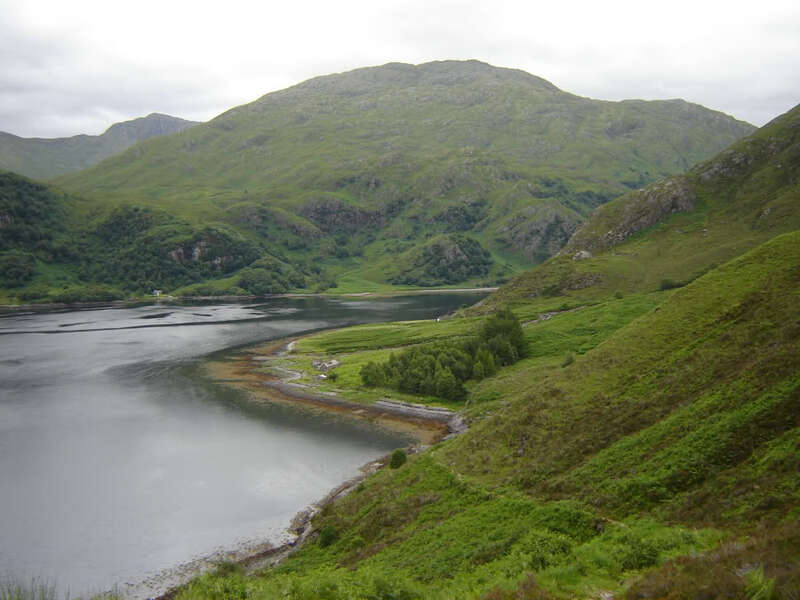 I think this would be a fantastic ridge walk in good weather – much much nicer than the low-level walk in from Kinloch Hourn. After spending a night at the Whitehouse, myself, Dave and Dave set off walking, at just after 7a.m., to make the most of the nice morning. 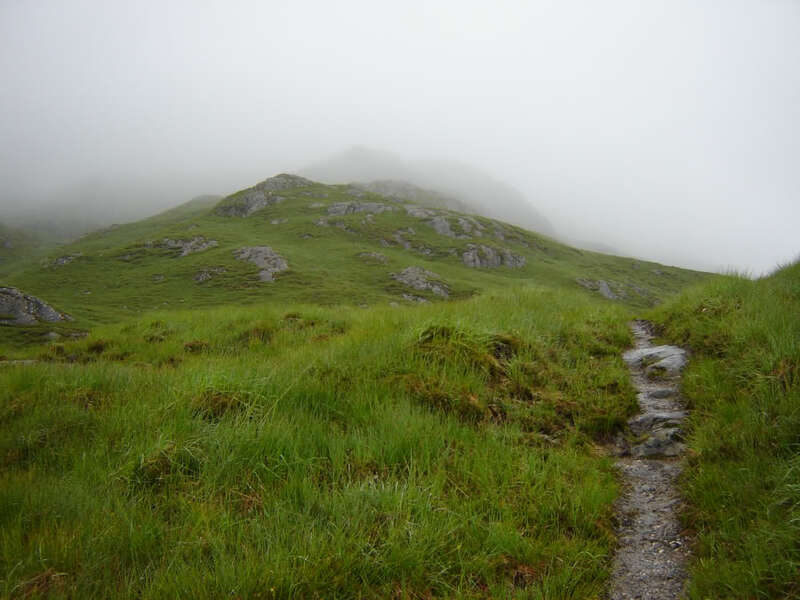 We followed the Gleann Unndalain track until passing the craggy knoll at the base of the ridge of Sgurr a'Choire Bheathe. It was great to walk with a light pack and in sunshine. Once on the ridge we simply made our way up towards the summit. The ascent is pretty-much at a constant angle as far as the 820m top. 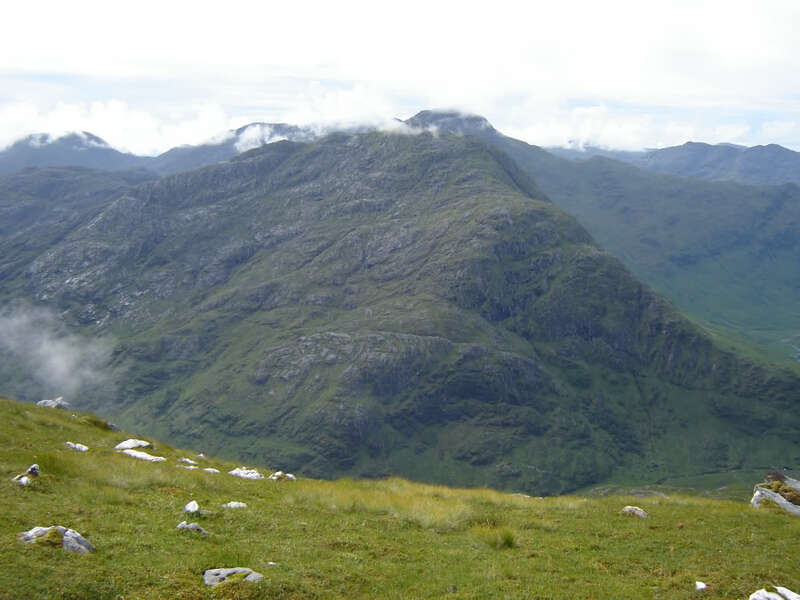 From about half way up the ridge, I took a couple of photos of the ridge I undertook the day previous. 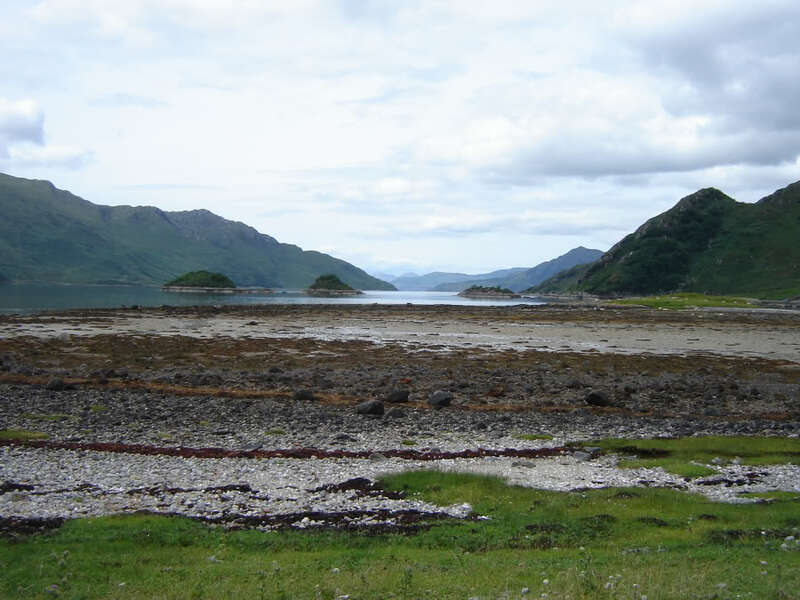 I was quite surprised at how close Ben Aden was to Sgurr a'Choire Bheithe. 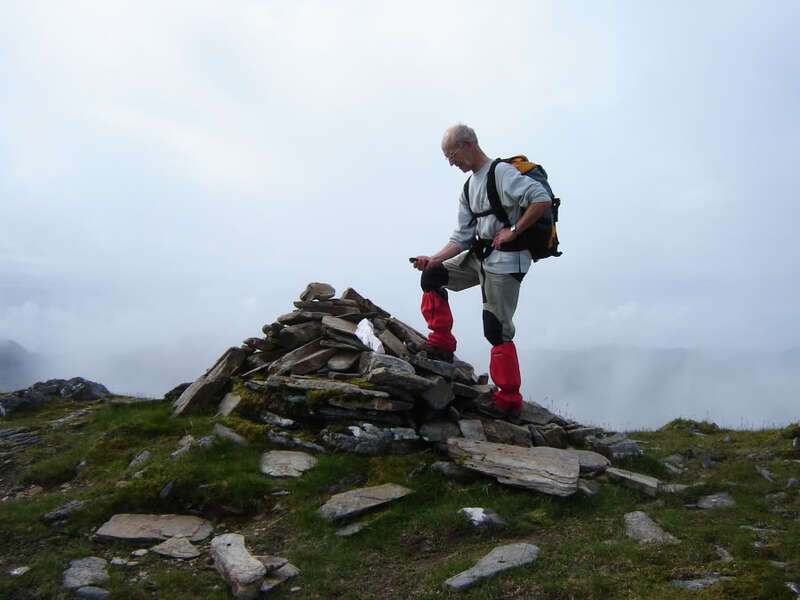 On reaching the summit we visited both cairns. 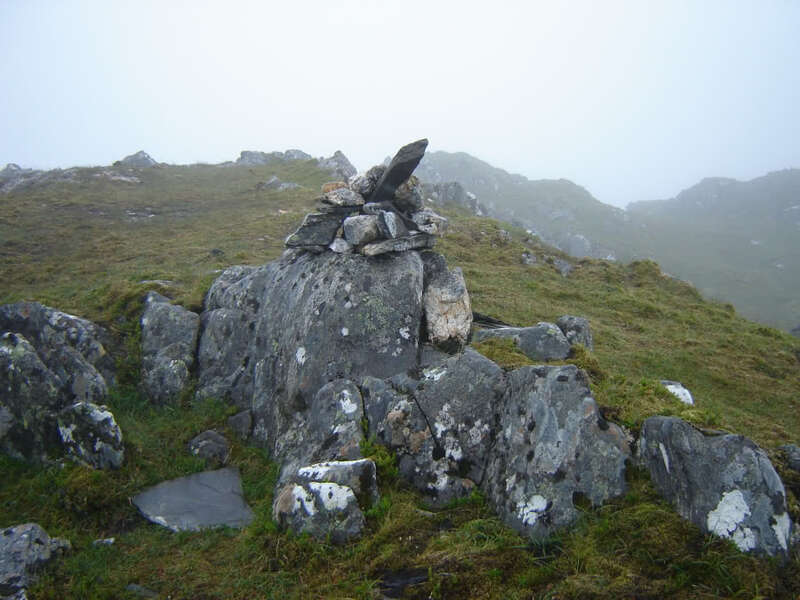 We thought the smaller cairn was slightly higher. 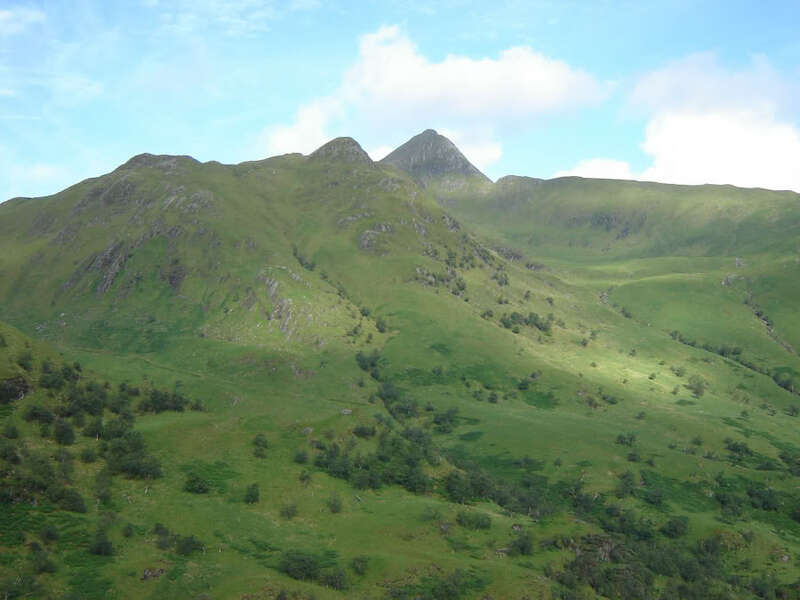 I was half-tempted to continue on to ascend Slat Bheinn. 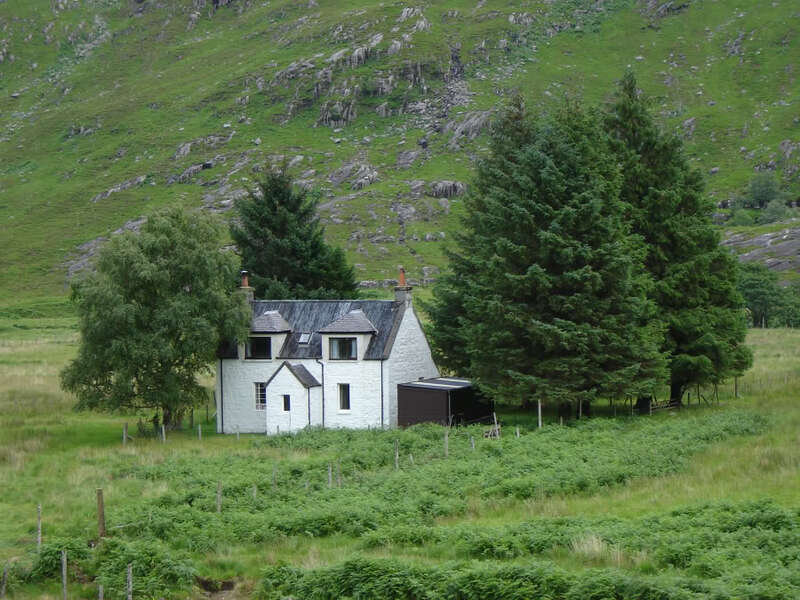 In the end I decided not to – a good excuse for a return visit. 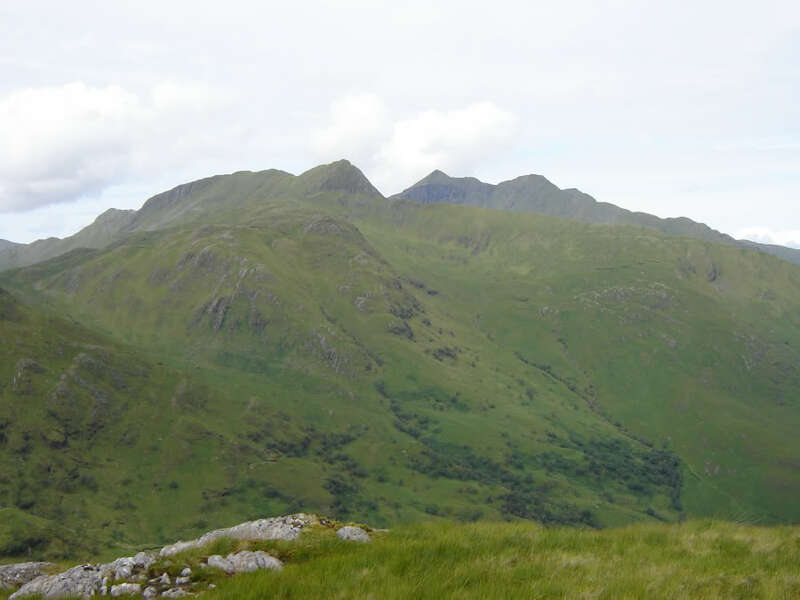 The Druim Chosaidh ridge of Sgurr a'Choire Bheithe looked really nice too. We made our descent back the same way. 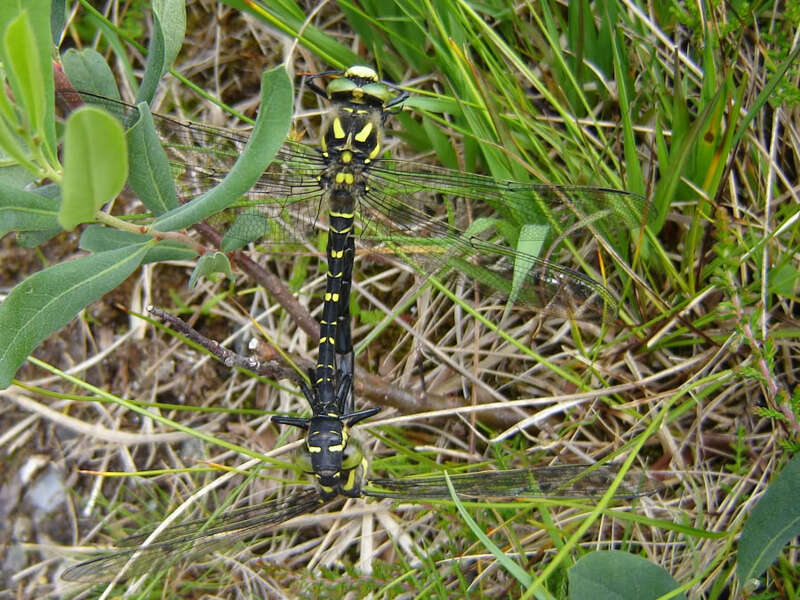 On walking back along the path towards Ambraigh, I spotted a couple of dragonflies. 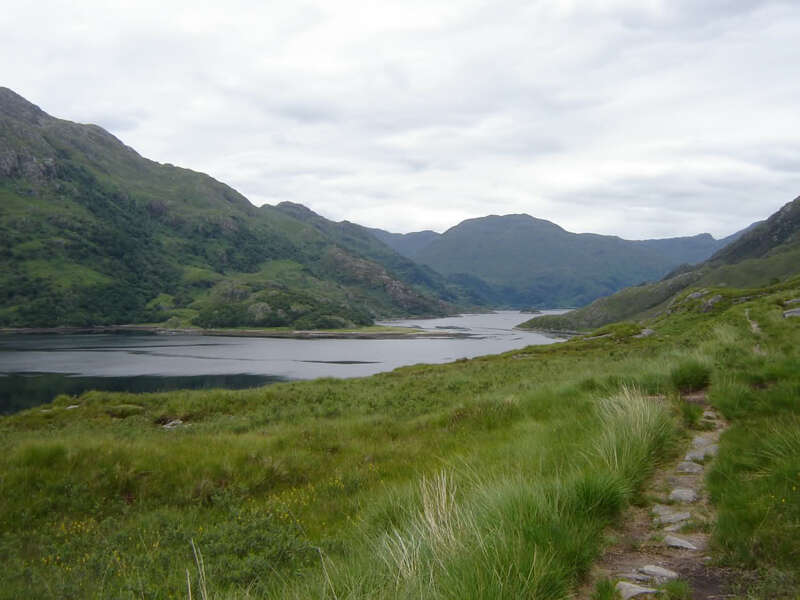 On reaching the Whitehouse, I decided to extend the day by walking out to Kinloch Hourn. I had the prospect of little supper owing to the can opener being bust, and, if I stayed on for another night it would have been too tempting to get the boat out with the others. I packed up everything and headed off again laden with heavy pack. 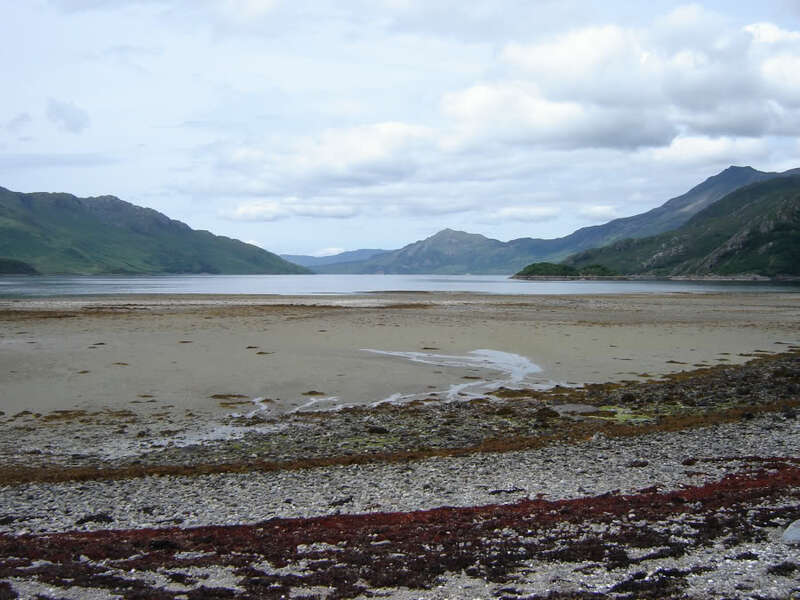 The walk round Barrisdale beach is really nice. 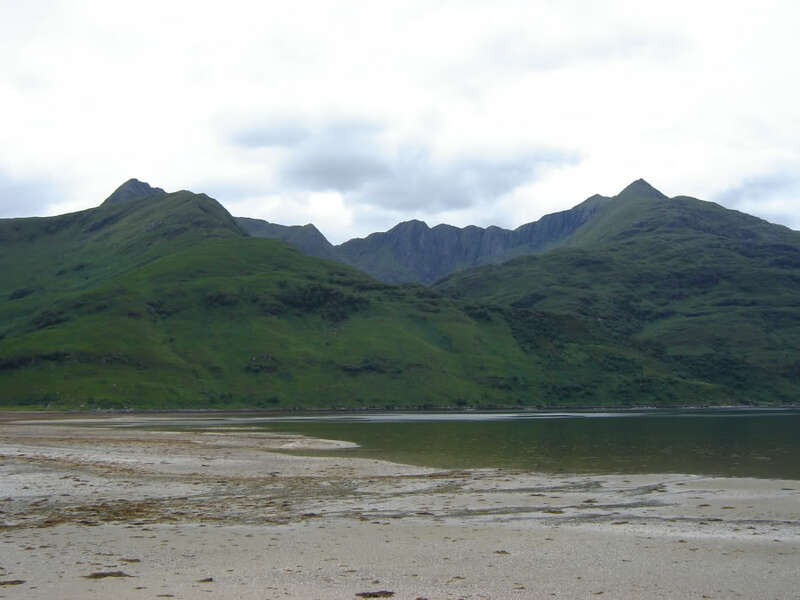 Ladhar Bheinn looks quite incredible from the beach. 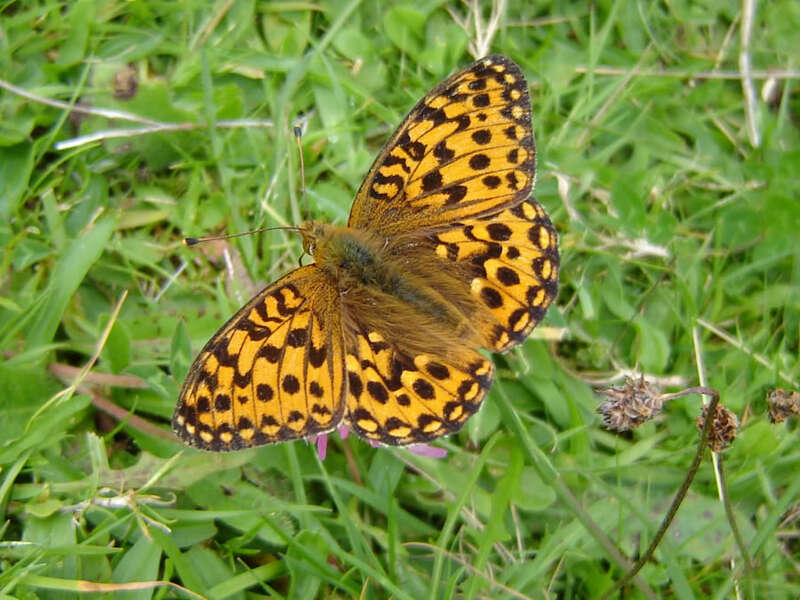 There were lots of different butterflies around Barrisdale. A vole also walked across the path about six feet in front of me but by the time I got the camera ready it was in the ferns. I really enjoyed the views during the walk out but I really didn't enjoy the path. 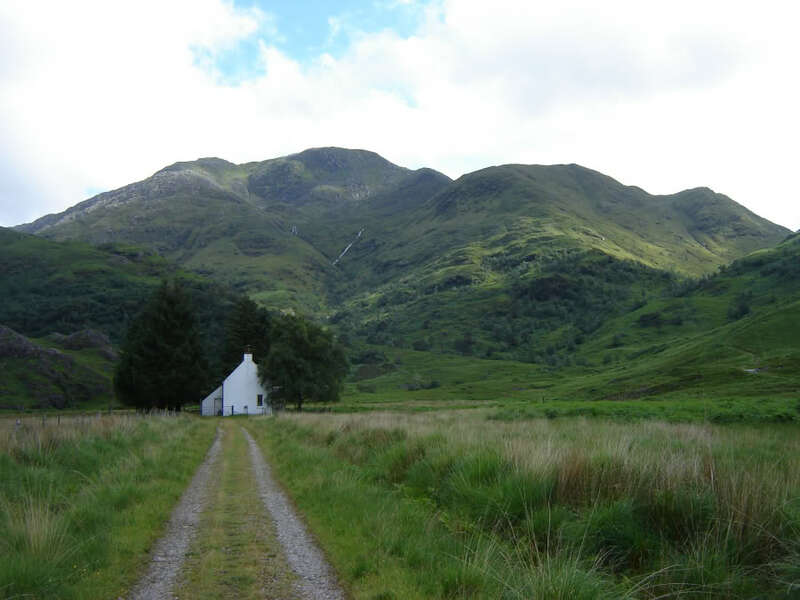 The path from Barrisdale out to Kinloch Hourn is now seriously overgrown in places. Possibly too many people using “Billy the boat” instead of walking in/out. Will be a shame if this path becomes impassable. There was more up and down than I had remembered on this route. 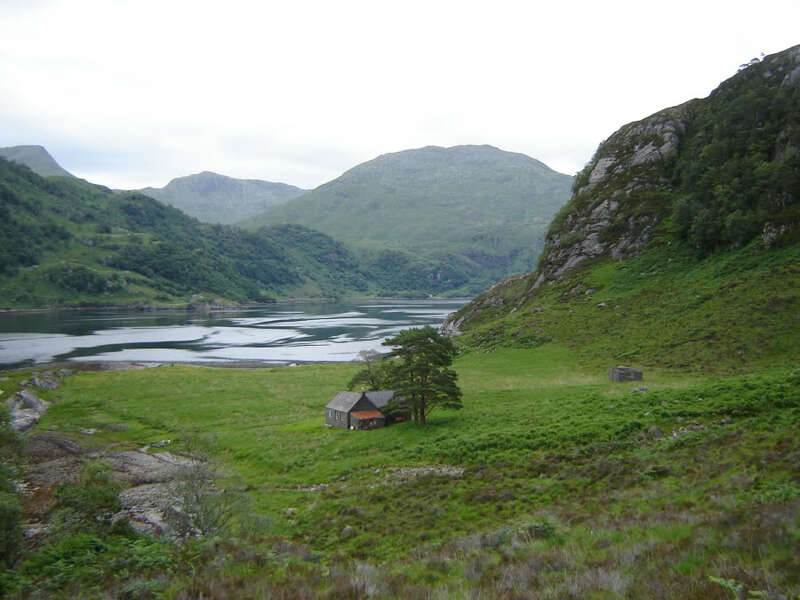 Dave had suggested it was a two-hour walk from Ambraigh to Kinloch Hourn. Aye right! 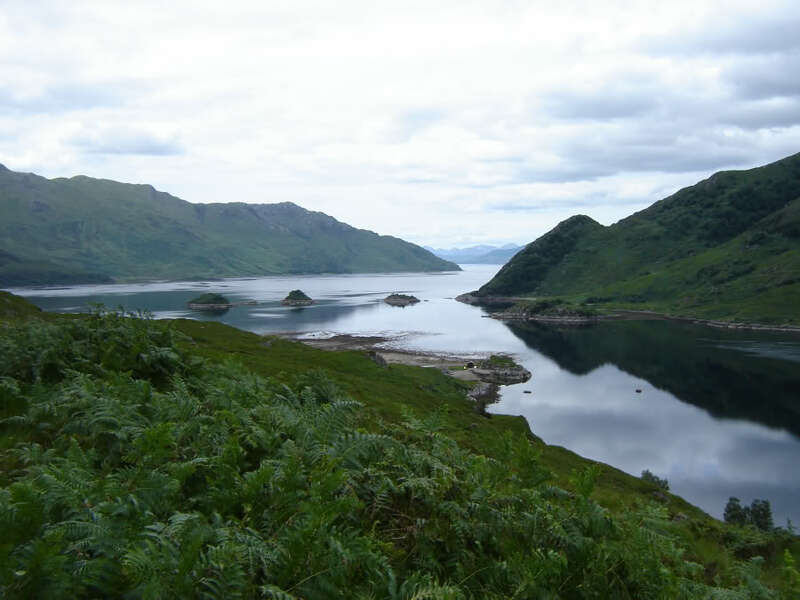 It took me around 3.5 hours to walk out to Kinloch Hourn. Was great to reach the car. This was only my second ever trip to Barrisdale. Hopefully it won't be my last.